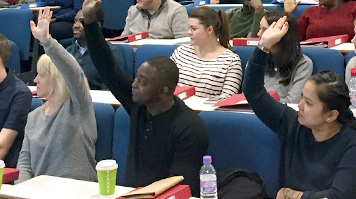 Over 80 trainees at London South Bank University (LSBU) have started testing a new Nursing Associate role created by Health Education England (HEE) to provide support to existing nursing care workers and fully-qualified registered nurses in the National Health Service. Last October, HEE selected LSBU as one of four sites in London and eleven nationwide, to deliver two of the national test training programmes for the new Nursing Associate role. One thousand trainees have been selected to take part in this national study. The Institute of Vocational Learning at LSBU is spearheading two of the two-year pilot courses. One course is being sponsored by partners Barts Health NHS Trust together with a group of organisations in East London, to deliver a comprehensive programme of training and experience for students in the fields of mental and community health and secondary care. The second test pilot is being led by LSBU in partnership with Great Ormond Street Hospital for Children NHS Foundation Trust to deliver a Nursing Associate programme specifically focused on children and young people. "It is wonderful to be welcoming the first of LSBU's Nursing Associate students to their course. Their enthusiasm and commitment to offer the best they can for their patients and to receive the education to really make a difference has made a lasting impression on me. I was impressed by the diversity of the group and the fact that, for some, the first day of this course was their first time inside a university. It is exciting to be in the vanguard of the delivery of this new role and to be supporting our first cohort with their goals." The role was developed by HEE based on recommendations made through the Government’s Shape of Caring Review, to create a new type of care worker with a higher skillset to support and complement the care already given by registered nurses.